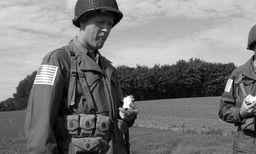 We are a small reenactment group, focusing on the American soldier of World War Two, the US GI. 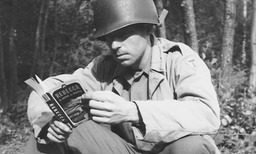 Our goal is to portrait the GI’s thru “photo-reenactment” and to focus on the details. The first theme we picked for our reenactment was the 36th Infantry Division, named the Texas Division. In our early days we were named the Texas Group, this name you will find in most of the articles and still is kinda our nickname. If you have any questions or just wanna say hello and share some information, you can sent us an email through the contact form. Well, havin’ said all this, I hope you’ll enjoy this site! P.S. Any misspellings or unclear images are my SNAFU’s. I apologize for that. Any sane person will agree that war is a terrible thing. But war has been around since the dawn of mankind and seems to hold a grim fascination for many. It certainly does for boys, young and old. 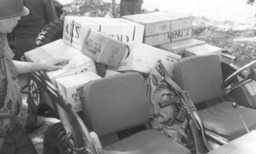 A few Dutch boys got interested in world war 2, in the 1970s. Scale model kits of tanks and airplanes were built and historical knowledge came mainly from books on the general history of the war. 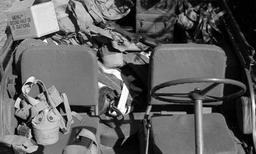 Detailed information on uniforms and equipment was scarce so we studied grainy black and white pictures of GI's in the various theaters of operations. 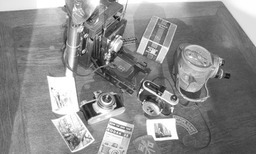 At the time army surplus stores and flea markets offered a seemingly unlimited and very affordable array of wartime artefacts. If it had a wartime dated stamp or tag it was o.k. Reproductions were still a long way off. It was during those years that the basis was laid for what is now the Yank Reenactment team. 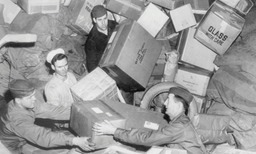 After years of collecting Cor Geluk and I decided we wanted to do something with what had grown into a sizeable collection of U.S. Army uniforms and equipment of the 1940-1945 period. In 1995 we hesitatingly participated in a 'Liberation Tour' in The Netherlands. 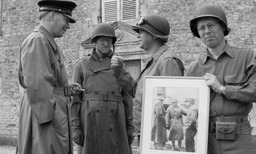 A great succes as here we met kindred spirits who owned wartime vehicles and had a keen interest in the budding phenomenon of living history aka reenactment. The combination of reenactors/vehicle enthusiast and militaria collectors, or 'boy scouts' and 'scale model builders' as an American friend coined it, proved to be a good one. The 'boy scouts' gave the necessary action impetus and the 'scale modellers' put in the attention to authenticity and detail. We started as the Texas Group, named after the 36th U.S. Infantry division, whose 141st regiment we had chosen as a theme. In 1996 four members of this group drove to the Vosges in France, to meet up with 36th Division veterans doing a battlefield tour. When waiting in the lobby of the hotel in Epinal I clearly remember feeling extremely silly, dressed in world war 2 GI garb. I wanted to go home. But then the bus arrived around 10 o'clock that night. One of the vets who saw us first said,"Hey, these must be the guys we left behind! ", the ice was broken and us youngsters carried their luggage to their rooms. It was late, they were all in their seventies, on a very busy schedule, but some stayed to talk to us at the bar and we were invited over for breakfast the next morning. That weekend we took several vets to their former battlegrounds in our restord jeep, we found foxholes with K-ration litter still. 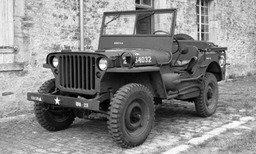 For some veterans it was their first jeep ride. We listened to their stories. Stories that often had been bottled up for over 50 years. Wayne Kirby for instance, an 81-mm mortar man, 142nd Infantry Regiment, spoke up for the first time on the tour, on a hill top in the Vosges. And we were there to hear it. On the way home, a seven hour drive, we were very quiet for the first couple of hours. We had just spent a weekend with a bunch of old guys and they had bowled us over. Our crazy world war 2 hobby all of a sudden did make sense. We would not have met these extraordinary men, who were put through two years of non-stop hell, as one of them described it, had we been dressed in jeans and T-shirts. Looking like they did all those years ago, wearing their old uniform, we must in turn have touched them to open to us up like they did. After all those years studing the grainy black and white pictures in the history books those same guys just had bought us breakfast! It was the first of many memorable meetings with world war two veterans. We had the rare privilege to get first hand accounts of world war 2. 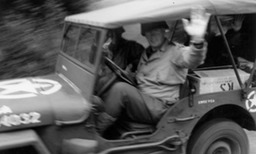 More trips followed to the Vosges, to Southern France, San Antonio, Texas to attend a 36th Division reunion. We went to Normandy of course, and closer to home; the Market Garden cities Nijmegen and Eindhoven in The Netherlands. Now with the number of world war 2 veterans dwindling, the members of the Texas living history Group having gone their separate ways to start families, careers, etc., a few members have kept the torch burning. Now called Yank Reenactment, we have taken to finding pictures of the liberation of the Netherlands, locating the exact spot they were taken and trying to recreate that scene with our modest means. The aim is still to keep the memory of world war 2 alive by portraying the American GI and by now also civilians in wartime costume.